50144 Private George William Lambert, 17th Battalion, the King’s (Liverpool Regiment) died 30 January 1918 and is buried at Ham British Cemetery, Muille-Villette, France. He was about 19 years old and is commemorated on the Cockfield War Memorial. In 1911, the family lived at Cockfield (no specific address). By this time Fred was a widower. He was the “village bobby” – a police sergeant. PC Francis Dent lodged with the family. At one time, G.W. Lambert was employed as a booking clerk at Cockfield Station. The service details of George William Lambert and the war diary of the 17th Battalion, the Liverpool Regiment have not been researched. 50144 Private G.W. Lambert did not enter France until after 31 December 1915. When Private G.W. Lambert enlisted and the exact date he entered France has not been researched and they remain unknown. Private G.W. 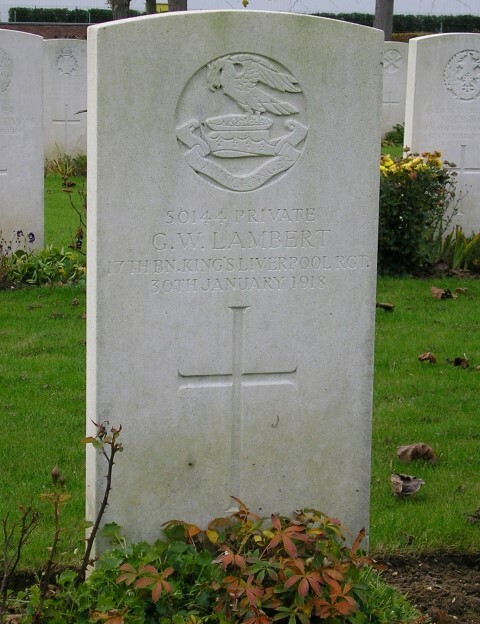 Lambert was the only soldier serving with the 17/Liverpool Regiment to die 30 January 1918. There was no major action taking place on that date and it is possible that he died of sickness. The circumstances surrounding his death will remain unknown until his service record is researched. Private G.W. Lambert is buried at grave reference I.B.22, Ham British Cemetery, Muile-Villette. There are 485 burials here, almost half are unidentified.